Light conditions on Labor Day enticed a host of pilots out to Makapuu for one last summer flight there. At least eighteen pilots showed up over the course of the day, and most of us got our fill of airtime. The conditions were on the light side, as evidenced by a couple of failed attempts to get up from Manics. (I trust that the proper offerings were made to appease the fearsome demigods of beach landings!) The light conditions also made for some interesting approaches to the LZ. It was great to see many of our wayward sons back out there yesterday (Doyley, Don, Bob, Seattle Ray) and it was just nice to be flying there on such a perfect light day. It was my first flight there in the new wing - somehow I've managed to go a couple of months without flying at Makapuu. Hopefully I don't have to go that long before the next one! 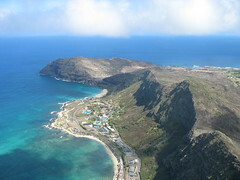 That's a great photo and perspective of Makapuu Alex. Hurry home so we can do it again.